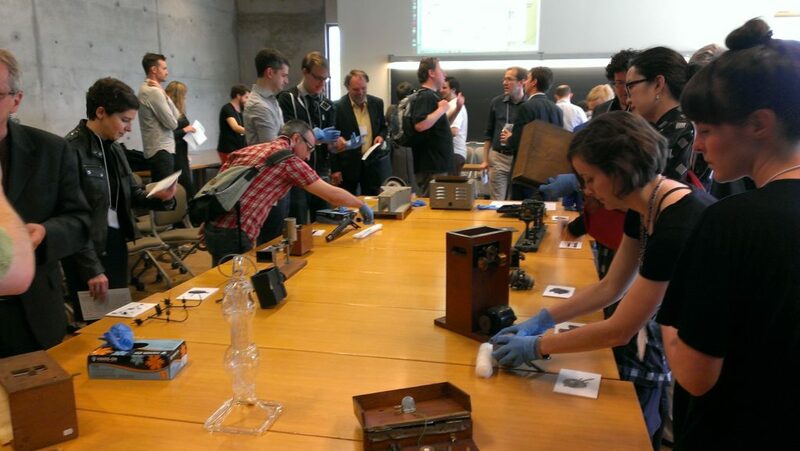 Recently, the University of Toronto Scientific Instrument Collection had the pleasure of running a workshop on unidentified scientific instruments. 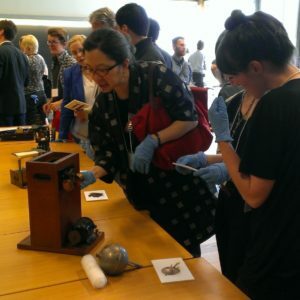 This workshop was held at “Materiality: Objects and Idioms in Historical Studies of Science and Technology“, a conference held at York University, which ran from May 2-4, 2013. As the UTSIC blog has previously discussed, there are a number of unidentified instruments in our collection. As a small, student-run project, we have decided not to focus our efforts on identifying each and every last object, but instead to catalogue, photograph, and post these objects online so that we can rely on the expertise of the broader community. 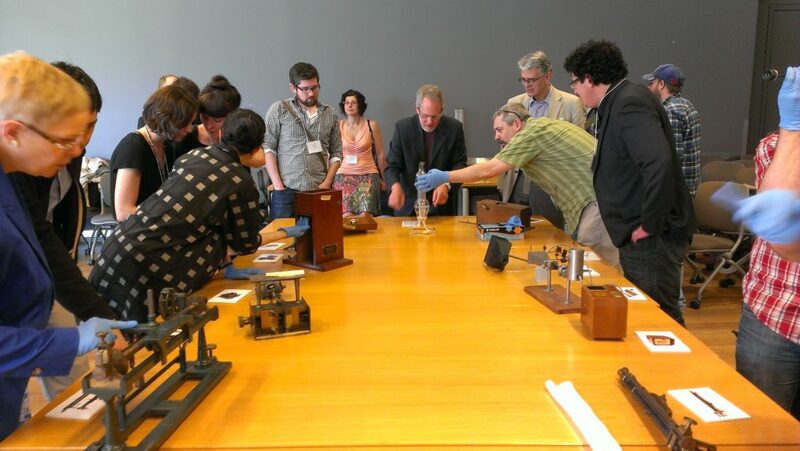 At the “Materiality” conference, the UTSIC held a workshop where attendees could inspect, explore, and puzzle over seventeen unidentified instruments. This gave us the opportunity to draw upon the expertise of others in order to help figure out what some of these objects are, while also allowing participants an exciting opportunity to physically and intellectually interact with truly unknown scientific objects. As you can see from the pictures below, the workshop was a hit as participants really got into pondering over what some of the bizarre instruments that lay before them might be. It is common practice for “material culture” workshops to be held where participants explore an unknown object. Commonly, after participants have been given an opportunity to guess what the object is and what it might have been used for, its true nature and purpose are revealed. 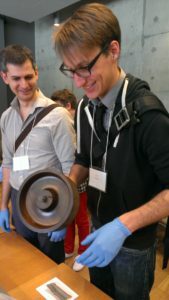 In fact, such a workshop was also held at the York “Materiality” conference by David Pantalony of the Canada Science and Technology Museum, which featured broken instruments, including some (such as a signal marker pen and a reed pipe) from the UTSIC. Our workshop was similar but with added twist that there was no grand “reveal” at the end: we really didn’t know what any of these objects were! Brass, glass, and wood: mystery comes in many materials. It appears that our decision to crowd-source has paid off. At the conference several of these instruments were identified, including a memory drum, and a peripheral vision test. A few days afterwards, we received some input from a visitor to our online catalogue, who helped identify, among other instruments, a saccharimeter, and a microwave generator. Still, there are many more objects that need identification, and as we continue to catalogue and photograph our collection we’ll continue to flag all of our “unidentified” instruments so that others can help us better understand them.